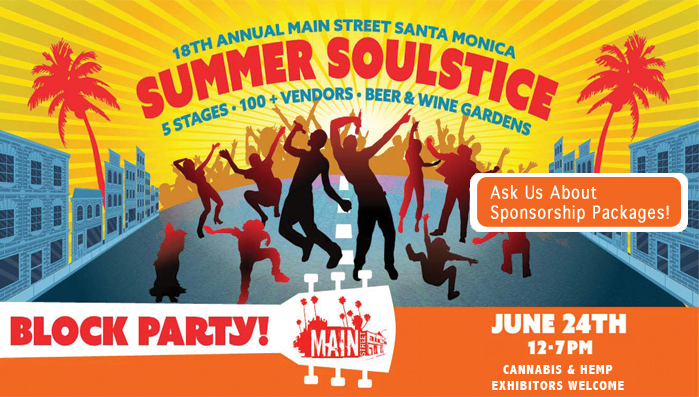 This is the 18th iteration of Summer SOULstice, and it just keeps getting better and better! For the first time, Main Street in Santa Monica will be closed to cars on June 24th, 2018 from Pico to Ocean Park and will feature a kid’s zone, 5 Music Stages, 18 bands, a puppy play time area, and vendors from Pico to Hollister, attracting 10,000 attendees!!! This is also the first year that cannabis businesses are invited to expo. To honor this ground breaking moment, we’re creating a Cannabis Gallery to showcase remarkable cannabis businesses. We are inviting the community to learn about the health benefits of this magical plant, the different types of administration, and to see the innovations that our industry players are bringing to market. Come by and say “Hi!” You’ll find us across the street from the Ashland Hill restaurant. 2807 MAIN ST, SANTA MONICA, CA 90405. For more information about the bands performing and additional vendors visit: the Main Street website here. Sponsorships are closed. If this first year is a success, we hope to do it again next year. Ask us about our other event opportunities. Annabis Handbags: Beautifully designed handbags with Aroma-Bloc™ protection so people can’t smell the lovely cannabis aroma contained inside your bag. Lulu’s Chocolates: Lulu’s fine chocolates are carried in Whole Foods and Erewhon. Learn about 1:1 THC/CBD infused chocolates for a greater sense of love. My Bud Vase: High Class Glass – repurposed vases and beautiful new designs as well. Contact us today using the form below to discuss future event inclusion.